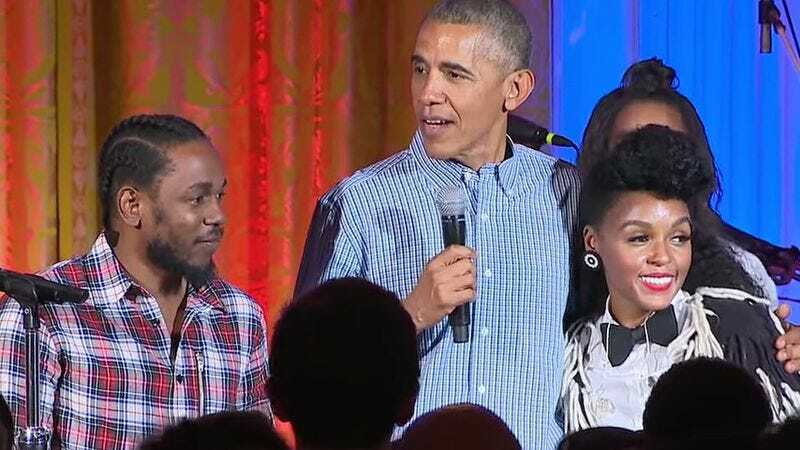 President Obama threw his final Independence Day party at the White House yesterday, and he invited Kendrick Lamar and Janelle Monáe to mark the occasion. The guest list included White House staff and members of the military, the latter of which the President thanked for their service in a moving speech about just this “unique” country of ours. The President also said that a lot of work remains to be done, and asked attendees and viewers to recommit to improving conditions for the country’s children, veterans, and indigent. But before leaving the stage (and Oval Office), President Obama took the opportunity to embarrass—that is, serenade—his eldest daughter, Malia, on her birthday. Monáe belted out her hit, “Tightrope,” with some backup singers, before paying tribute to Prince. The Electric Lady artist launched into a cover of “Let’s Go Crazy” after acknowledging the late icon’s far-reaching influence.